I don’t get much of a chance to wear beanies here. It’s only cold enough for a brief spell during winter and even then, usually only in the early mornings. I still love knitting and wearing them though. Bluff Knoll is a two colour beanie knitted in two colours of Madelinetosh Tosh DK that I found in my stash and had to use them together and they had to be a beanie. 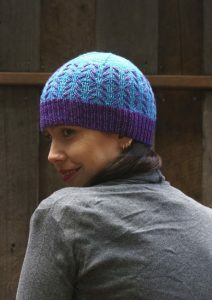 It features a contrast coloured brim and stitch detail on the body of the hat. repeat where you work with both colours at once. And the effect, well, I love how this works in a variegated/multicolour yarn. The version pictured on the right was knitted by one of my test knitters, Danielle Basore , and I love how each round of contrast colour stitches, of which she used The Verdant Gryphon Traveller in La Sagrada Stained Glass, is a different colour. It has created a lovely effect and one I’d love to knit. Thanks OnEdge! 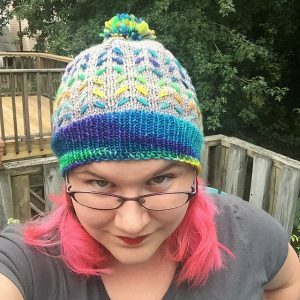 The pattern comes in 5 sizes and is a great unisex beanie. You can find out more about the size and yarn quantities needed on its ravelry page. Bluff Knoll is named after the tallest mountain in Western Australia. It’s down on the south coast near Albany and it’s the only place in WA that gets snow.